Overcoming duality, yet binding: the trinity. Beyond the contrast of two, it initiates the concept of many. Albertus Magnus claimed that three lives in all things. In Old Saxon, the month of May is named trimilki, season of three milkings. Number as quality depends upon the visual field. The ancient Egyptian sign for the plural requires three strokes. Lao-tzu said the triad produces all. Acronyms, sports, and traffic lights reflect our ternary culture. The devil may appear in the form of a three-legged hare. Representing the unknowable: I, you, and the beyond. The figure of completion, the number of the cube. The scale as a succession of thirds. Imperfection implies the concealment of perfection. Shiva’s number, his eyes, his braids, his place. The triangle in Euclidean space. I walk the three roads to the commonplace, preferring rhetoric. Three to through, it penetrates the personal, unhinges that door. “That Number upon Which the Demand Lieth” was published in Posit: A Journal of Literature and Art in September 2017. I am grateful to editor Susan Lewis for taking this piece. This entry was posted in numbers, Poetry and tagged anthropology, creative writing, culture, language, numbers, philosophy, poems, poetry, psychology, writing by robert okaji. Bookmark the permalink. I greatly enjoyed reading this – you have a great way of tying all these concepts together and reiterating the premise throughout but remaining fresh with the language. The wannabe philosopher in me loves this piece. Also, the idea of 3 initiating the concept of many reminds me of Matthew as an 18 month-old (approximately) baby figuring out how to count. He would point to the first object and say, “One,” point at the next and say, “Two,” and if there were three or more things, he would kind of throw up his hands and exclaim triumphantly, “All the two of them!” (Hmm. I feel like I’ve mentioned this before…) Yes, it seems overcoming duality is a big step for us mere mortals. find your poem a triumphant of delight. Now you’re in the spirit! Thank you, David. 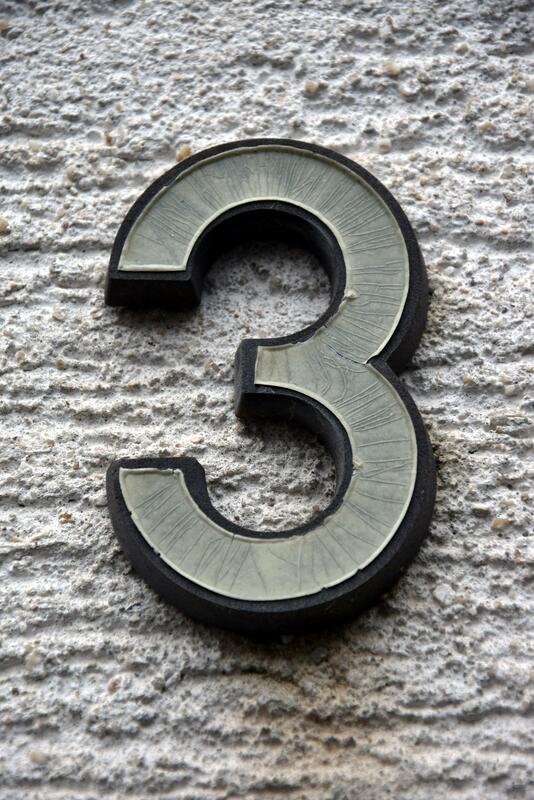 3 is my favorite number! Great tribute. It is a spectacular number! Thank you. three — are the corners of our heart; a rounded triangle wishing to assign us to a trinity of faith, hope and charity. I like that image, Steph. Thank you. A fascinating read Robert, although the number three is not a good number for me. It’s interesting how some numbers take on additional meanings.